Less than three months ago, Pam Correll, baker extraordinaire, was happily competing at the National Festival of Breads competition. 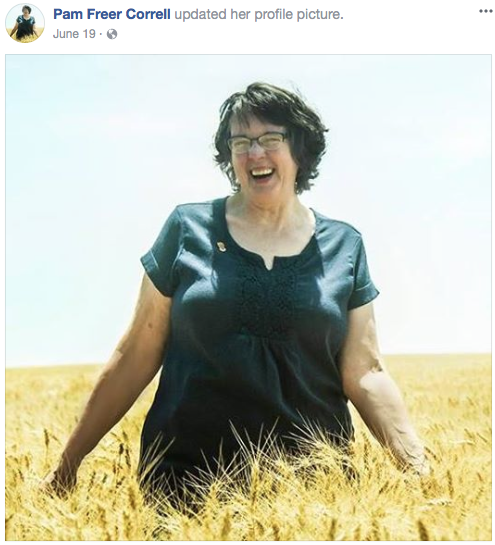 In a shocking blink of an eye, Pam lost her life to cancer last week. How do these tragedies happen so quickly and unexpectedly? In the time in between, Pam, who I had never met, took the time to send me a few cookbooks to help rebuild The Culinary Cellar after the flood. 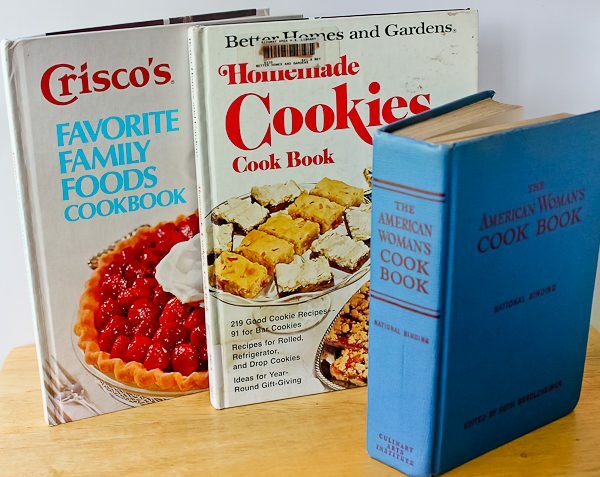 Even though we had never met, we shared a love of cooking and cookbooks. I would like to share her words and books with you. How I wish I could say these words to her: Yes, Pam. We do “sort of” know each other because we share a passion for cooking. Although I would say it goes beyond “sort of.” There is some kind of strong bond between home cooks who have this passion and it carries through with words and kindness that are felt even if the physical meeting never happened. I felt an instant bond with Pam just by reading her words and understood everything she was saying. Pam beautifully expressed that she hoped with these books I could “love the feel of them and can smell some of the goodness in their past. Oh, if they could talk!” I don’t think I have ever read it expressed any better than that. When all of my cookbooks are back on shelves again, and I gaze over all of them knowing they all came from the heart from friends and people like Pam who I didn’t even know, I will as Pam said, love the feel and smell of every one of them. To me, it’s not if they could talk. To me, they do talk. When I pick up these books from Pam, her good nature, kindness, and generosity come through all the way to my fingertips. I treasure her books, and they already talk to me. Pam was a family and consumer science teacher for both high school and junior high where she taught students how to bake. I can only imagine how much she loved that job, and how her students loved her right back. According to her biography in The Festival of Breads booklet, Pam’s love of baking began at a very young age through her mother who baked every weekend for the family. Between the wonderful smells of the kitchen and the excitement of waking up to something made so lovingly, these gave Pam her passion for baking. Pam’s entry in the bread contest, “Orange Marmalade Breakfast Crescents,” was taken from one of her mom’s kolache recipes. Pam likes to take a base recipe of some kind and put her own twist on it. She said she loved breakfast buns along with the intense flavors of orange marmalade and orange zest, which is why she came up with the recipe. “You get a little bit of orange in every single bite; it’s not just a subtle flavor. There’s orange in the dough, there’s orange marmalade wrapped up in it, there’s orange glaze and orange zest. It’s completely orange throughout the whole thing,” she said. Can’t you just taste the intensity of the flavors and the intensity of the love Pam put into them? Finalist in the National Festival of Breads. Pam said, "Make these and think of me." Using a microplane zester, grate just the outer layer of orange for the garnish. Extract juice from 3-4 oranges and reserve for the dough and glaze. In a large mixing bowl, whisk together warm orange juice, yeast, oil, sugar, egg, and salt. Wait 5-10 minutes for mixture to foam (proof). Stir in 3 cups of flour to make a soft dough. Turn dough onto a floured surface, adding more flour as needed. Knead until smooth and elastic, 8-10 minutes. Transfer dough to a lightly greased bowl, turning once to coat. Cover with plastic wrap and let rise until doubled, about 1 hour. Lightly grease or line with parchment a 12-by-18-inch baking sheet. Gently deflate the dough, and transfer to a lightly floured surface. Roll dough into a 20" circle. Cut circle into 12 equal wedges. Spread 1 Tablespoon orange marmalade on each wedge. To shape, begin at wide end of wedge and roll toward point. Pinch point to roll to secure. Place, point down, 1" apart on prepared baking sheet; curve ends into a crescent. Cover; let rise for 30 minutes until nearly doubled. Near the end of the rise, preheat oven to 400 degrees F.
Bake for 10-13 minutes, until light golden brown or the internal temperature in about 190 degrees F. Transfer to rack to cool. Combine glaze ingredients until smooth. Drizzle over the crescents and garnish with orange zest. Makes 12 crescents. Pam with her fellow finalists at the National Festival of Breads contest. You will live in the hearts of many, Pam. Happy Birthday to my Firstborn, 2017! Love how you preserved Pam’s memory here. Her goodness is celebrated and no one will forget. Thank you, Lisa. Pam and her goodness will live on. How wonderful that Pam was your close friend, Donna. As you said, I feel very blessed to have a part of her. I am lucky enough to have taught with Pam and also be her neighbor as neighbors go in rural areas where neighbors can live several miles away from each other. Through the woods she lived less than a quarter mile away. Each Christmas as well as many other random times of the school year amazing baked goods and homemade candies would appear in the mail room of the front office. We were sometimes her test kitchen of one of her new “experiments”. I loved Pam’s caramels and I am blessed to have her recipe, but never had to make them because it seems I was always In the right place at the right time. Sadly, now I must see if I can match Pam’s talents. 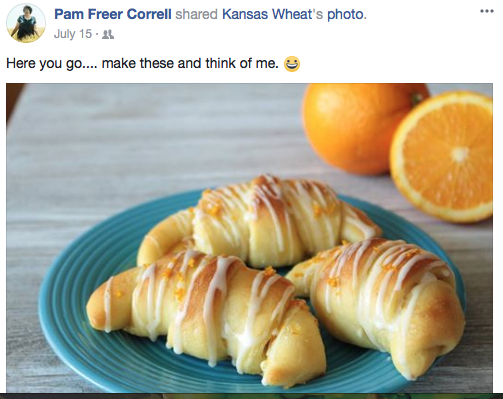 The crescent orange roll posted piqued my interest when I first saw it when Pam posted it. I love everything citrus and was exploring making it with my homemade Meyer lemon marmalade, made from the lemons I manage to grow in North Central Pennsylvania. As you know from the note Pam included with the gifted cookbooks, that she was an amazing human being. She was loved and will be missed by all that knew her, even if you never met. Thank you so much for writing, Sue. I love your Pam story and so sorry for the loss of your dear friend. What an amazing woman she was. People cannot say enough good things about her. 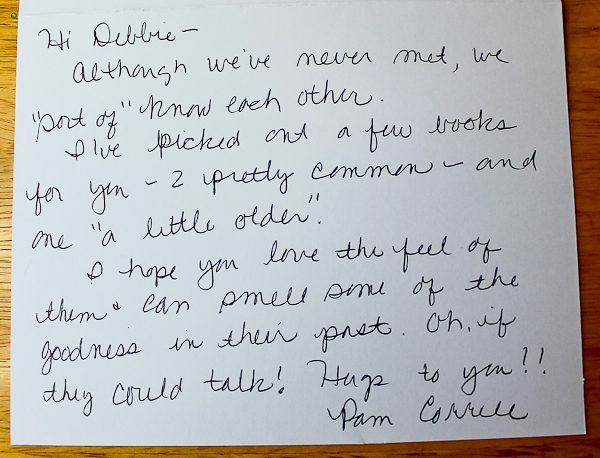 Oh Sue – I am Pam’s cousin and loved her caramels so much! I am fighting cancer right now and would love when a package of Pam’s caramels would travel to my house 🙂 She was one remarkable woman and those of us lucky enough to have known her either in person or not, were truly blessed. Donna, I am so sorry for the loss of your beloved cousin Pam, and that you must fight cancer yourself at this time. Everyone reading here will keep you in their thoughts and prayers, I’m sure. A beautiful tribute! My condolences to her family and friends. I was one of her students from Ridgway middle/high school. She had a true passion for what she did. She loved all her students as if they were her own. She was also my home room teacher when I was in high school. She was always willing to alter my dresses for dances and with left over material she would make a purse or some other accessory for my dresses. She was a great teacher and would do anything for anyone. She has passed but she sure will not be forgotten. Thank you for sharing your lovely memories of Pam, Tara. How lucky you were to have her as your teacher. What a loving heart Pam had! Thank you so much for writing, Pammie. I can only imagine how much you must miss your Aunt Pam. I’m so sorry. What an amazing lady she was. You’ve said everything so beautifully, Debbie. Pam will be missed by so many, including those of us in this special cooking community. Thank you for sharing, Debbie. Thank you, Kellie. It’s wonderful how Pam was a bright light in our cooking community. She will be missed. Such a beautiful tribute! To someone I didn’t know but felt I knew her from just reading this beautiful story!! Anyone with a love of cooking can feel it through her love and her wonderful smile! Praying for all who loved her! Deborah, isn’t it easy to feel like you know Pam simply because her spirit was so strong? I know exactly what you mean. Thanks for sharing a little bit of the warm and welcoming heart of this beloved baking friend’s life. What a joy it must have been to be in her kitchen, where baking was Pam’s happy place. May the Lord comfort all those grieving with the rich and flavorful memories of her life. Kim, Pam and I remodeled our kitchens the same summer and we frequently discussed and checked on each other’s progress. I love that Pam sprung for gorgeous copper sinks, so fitting to the cook and baker she was. Her kitchen was cozy and inviting and finished months before mine. Thank you for this tribute to Pam. She was a wonderful person and a very caring educator. I appreciate your thoughts and memories of her and I am sure many from the small town of Ridgway, PA will agree. Such a fitting tribute! Thank you, Laurie. It’s very kind of you to write. So many people miss Pam and it’s evident how much she was loved. I’m sorry for the loss of your dear friend. I’m Pam’s husband Mel and I’m touched by your words. I can tell you how she felt about her job. She’d regularly say to me “I can’t believe they pay me to do this.” And one story about her homeroom students. She’d make a dessert of their choice for their birthday which everyone in the homeroom would share. If your birthday was during the summer, then you chose a day during the school year that didn’t interefere with someone else’s birthday. Blessed beyond words to have been her husband for 39 years! Mel, from what everyone says about your beloved Pam, I think you were the luckiest man on earth to have her as your wife. I am so sorry for the loss of Pam. What a lovely story about the homeroom birthdays for her students. Thank you for taking the time to write. May God bless you and your family at this time and bring you comfort. I just read the story of Pam Correll. She sound like a beautiful person, inside and out. I know that she in Heaven, doing what she does best. This is a lovely tribute to our sweet friend Pam. Her smile lit up the room and she was such a sweet and talented lady. I’m so glad I got to spend time with her at the bread contest at one of the happiest times of her life. God bless Pam and all who loved her. 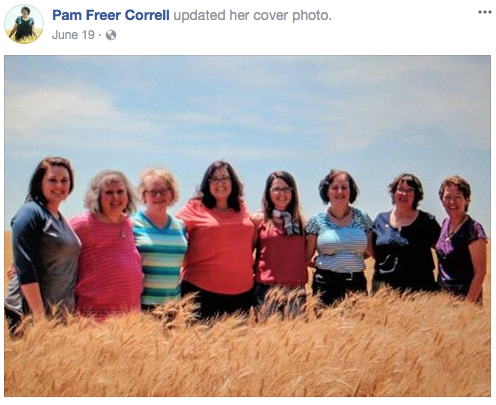 Thank you for sharing this tribute to your friend, Pam Correll!